Linda, from A Muse, posted pictures of me and my baby on her blog! Check it out here!! We have made it home from the Northwest, and I am EX-hausted! We had so much fun, and accomplished our goal! We were in Seattle to pick up my 83 year-old grandmother and move her back here to KC! The move went very smoothly - Grandma was a trooper on the plane (she and Lily napped together!) and she is now getting settled in her new Assisted Living Facility here! She seems very happy! I hope that she will continue to adjust well! Leaving her there today felt like my son's first day of kindergarten or daycare! I know it's a great place, but I also know that Grandma will never really be able to tell me if something is wrong ... kind of scary! Wait ... I know you're getting ready to run away ... isn't this supposed to be a stamping blog?? I did get to do a little bit of stamp shopping while I was in the Northwest! I went to Ikea in Portland and stocked up on a few storage options (pictures later! ), then went to Craft Warehouse, where I was very disappointed that they no longer carry the long ruler with the piercing holes in it, but I did find a new yummy Basic Gray 6x6 pad! Then we went on to Seattle! I didn't have a ton of time, but I did run into Impress to pick up a couple packs of the clear boxes and then I went to The Mother Ship ... the A Muse store!! Again, it was an amazing experience! I just think that Linda is one of the best people around! She is so friendly, and so smart! She has some exciting things up her sleeve ... I can't wait to see them! I only had about an hour to spend in the shop - I could have stayed there all day!! Here are a couple of pics from A Muse! I will take pictures of my goodies and post them soon! Now, I am so flippin' tired! Must go to bed! The Amazing Linda holding my baby - makes me think about Presidential campaigning when people want the candidates to kiss their babies - forget that - Linda held my baby!! Me, Linda & Lily - Linda looks very tan next to us pale Kansas folks! I just love the color of the shop! I made this little gift set as a Thank You present for my cousin Lauren. We will be visiting with her while we are in Seattle, and she gave me the most darling outfit for Miss Lily - so I wanted to do a bit more than just a card! 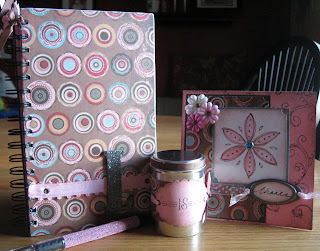 The notebook, pen and chocolate tin were incredibly fast, but I could not get the layout on this card to look right! I must have messed around with it for an hour! I think I have gotten way stuck in the A Muse mindset - cards should not take more that half an hour, tops!! The paper is all from the Basic Gray Blush collection. The pen is just covered in pink microbeads - couldn't find any clear ones last night! Stamps by SU and A Muse, CS & hardware by A Muse, paper by Basic Gray, flowers by Prima, ribbon by May Arts. Have I mentioned that I will be in the Northwest later this week??? I am so excited, I could just about burst!! The main reason for my trip is to get my grandmother and move her here to Kansas, where I live ... but I can't go to the NW without doing lots of other things! So, we are flying into Portland where we will visit with my best friend from grade school (kind of weird to think about being friends with someone for 28 years - we played soccer together in Kindergarten!) and check out the new Ikea store!! I am very excited to see the new store! We will also get to see one of my Uncles and his wife that I haven't seen for years! Then we will drive up to Seattle and get everything together for the big move! I will of course be making time to visit the A Muse store (I am hearing beautiful music in my head, like when someone in a movie comes out of the dessert and finally reaches his destination). I just love it there - if you have never been to the store, you have to check it out! Linda and the girls are so incredibly friendly ... it just feels like home in there! Sometimes, I dream about it! Okay, I really am a junkie! I will take lots of pictures and share them with you when I get back next week! How sad is it that I can stamp straight, but I can't take a straight picture to save my life! I really need to work on my photography skills! I would really like to find a frog - the little pointy thing that people used to use for floral arrangements- like Linda from A Muse uses to take her pictures! I need to start looking in antique stores for that! 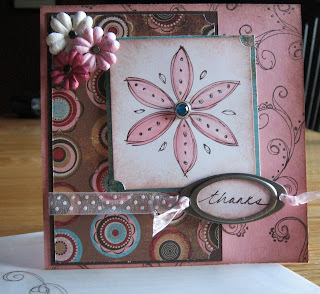 This is just a super quick thank you card - seems like I am forever needing thank you cards, so this challenge is right up my alley! This one will go to some of my Grandmother's caregivers in Tacoma. 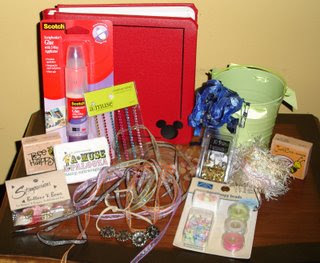 Stamps by A Muse, CS, ribbon by SU, punch by Marvy ... I am really diggin' the color combo - Wild Wasabi and Regal Rose! It works! I finally got my hair cut and highlighted last week - and left my wallet at home ... oops! Pretty typical for me, unfortunately! My amazing hairstylist, Ty, was incredibly understanding! The poor guy has been putting up with me and my mom for 8 years - he knows I can be a flake! So I made him a quick card to go with his check! Can't really tell, but the super guy is colored with my SU Ruby Red marker, then the Versamarker and IIEP - he's super sparkly! I told Ty in the card that he brightens my hair and my life! 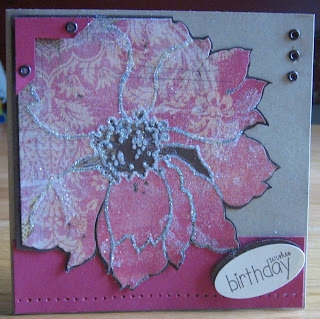 Stamps by A Muse and Stamping Bella, CS by SU (I used Ruby Red on 2 cards - I don't think I have used it in a year! ), Punches by SU and Marvy, ribbon from May Arts. 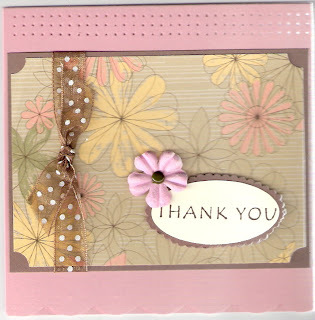 This card was originally for last week's A Muse Addict's challenge (Use your words), but it also works for this week's Say Thanks challenge! Glad that worked out - now I don't feel so far behind! This was a quickie - again, minimal stamping! Stamp by A Muse, CS, punches & paper by SU, ribbon by May Arts - can't really see it, but the bottom of the card has a scallop made with the SU small corner rounder! 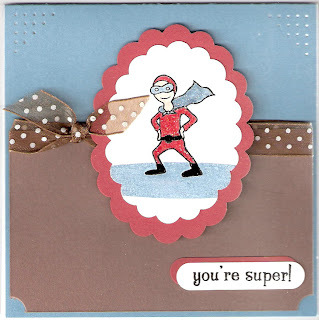 This is the card that I made for Michelle's Crazystampchick's last AMAP swap! I can't wait to get mine back and see what everyone has done with the new A Muse stamps! 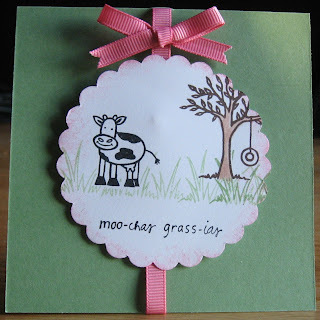 This was a pretty easy card - thank goodness for the stamp-a-ma-jig!! 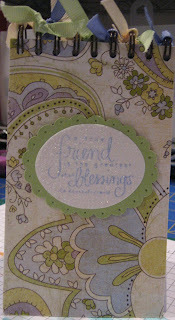 Stamps by A Muse, CS, ink, brads, markers & twill tape by SU!, flower by Prima. Have a great day - thanks for looking! Little Miss Lily is quite proud of herself ... she can sit up all by herself!! I can't believe how fast she is growing! Seven months already! We are having so much fun with her - she is such a happy baby and an amazing sleeper! Third time's a charm! Just couldn't resist sharing a recent pic of her ... more stamped stuff later! I have had about a ka-jillion birthdays to celebrate in the last couple of weeks ... There are lots of people that I love who were born in August! I actually got some stamping done (not all the cards have made it to their destinations yet, but I did get them done!! Here are three of them! Thanks for looking - have a great Tuesday! Some people do spring cleaning ... I tend to do my "big purge" in the fall! I think I will forever think of August and September as the start of the new year ... new schools, new school supplies (always my favorite part), a new calendar ... it just gets my purging juices flowing! So, yesterday I cleaned my van for hours (I was all ready to sell the sucker and get a new minivan, but the voice of reason, also known as my husband, Ben, talked me down - oh well, at least I have a clean van now!) and today I have been tackling my kitchen ... it feels kind of good to have organized cabinets - maybe it will last a week or so!! Blah, blah, blah - sorry for the rambling ... I do have a project to share!! This little notebook is one of a set of three that I made for me and the girls when we went to A*Muse*A*Palooza in St. Louis - just in case we needed to jot down any amazing ideas! 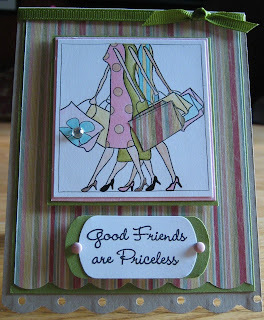 I love the Basic Gray Lilykate collection, and this is one of my favorite A Muse stamps! I just love to make little notebooks like this! Thanks for looking - hope you are having a great weekend! Details: Paper by Basic Gray Lilykate collection, CS by SU!, stamp by A Muse, Iridescent Ice Embossing Powder by SU!, ribbon by SU! Miss Julie over at The Ink Spot special ordered this amazing MFT set for me when I was there for A*Muse*A*Palooza (I get choked up just a little bit when I type that - I miss AMAP!)! I got it in the mail this week, and was so happy to get to play a bit last night!! My husband and I had a bit of a "date night" last night - dinner with grown-ups - no kids, whoo-hooo!! It was fun, and we got home early enough that I got to stamp while Ben watched the end of the Royals game. This is what I came up with! Looking at the girls this morning, I think I could have given them a bit more sparkle, but oh well - next time! 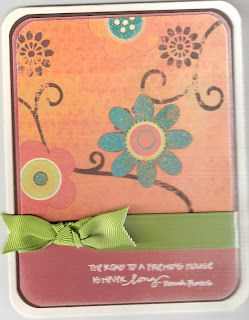 If you need this set, or any other MFT stamps - get on over there TODAY! They have 4 neat new releases, and FREE SHIPPING!! Details: Stamps by My Favorite Things, CS (whisper white, kraft, pretty in pink, old olive) by SU!, Paper by My Mind's Eye, Ribbon from a Taylor share, punches by SU!, brads by Heidi Swap, bling from Archiver's. I was lucky enough to win some blog candy (my first!) on Kristina Lewis' blog Balance!! It was a such a wonderful surprise to find my package in my mailbox!! Thanks so much, Kristina! I may have to plan a trip to Disney so I can fill up this great album!! Check out Kristina's blog - she is mucho talented!! I am so excited to get my hands on some of the new A Muse ribbon! I was really wanting some, but can't quite justify spending lots of money to have more ribbon than I will really need! Anyone out there interested in doing an A Muse ribbon share?? If there is interest, I would be more than happy to order some and get it going! Let me know! Have a great Wednesday! So, late last night I was feeling very "stamp-deprived"! It has been almost a week since I even set foot in my stamp room - so, I finally made it downstairs at 10:00 last night! My plan was to work on some of the Dare to Get Dirty challenges, but I got sidetracked by my pile of beautiful Basic Grey paper! This flower from the Urban Couture line just screamed to be cut out and made sparkly! I may have gone just a bit overboard with the Quickie Glue Pen (love that thing!) and the dazzling diamonds glitter - but overall I am pleased with the end result! I really wanted to put some ribbon on this, but I couldn't find a good place ... oh well ... maybe next time! Thanks for looking - have a great day! Details - Stamps (one, lonely stamp) by A Muse, CS by SU!, punches by SU!, eyelets by Making Memories, holes punched with my new little Cutterbee piercer - jury is still out on this baby - I'll play some more and let you know what I think!